Tomato stem canker caused by Alternaria alternata f. sp. lycopersici, is one of the most devastating diseases worldwide. In this study, possible effect of using Salicylic Acid (SA) in host resistance induction against tomato stem canker was investigated. Foliar applications of salicylic acid with two concentrations of 200 and 400 μM were tested against fungal pathogen. The results demonstrated that use of 200 μM dosage of SA was insufficient for inducing disease resistance. However, applications of SA in concentration 400 μM significantly reduced disease index as compared with infected control. There were significant effects of plant cell reactions in terms of percentage of penetration events that occurred at the site of attempted penetration. SA pre-treated plants were identified with higher numbers of single cell necrosis (hypersensitive response), but lower blighted areas and discolorations, as compared with non treated plant (control). The results obtained from high performance thin layer chromatography (HPTLC) analysis indicated that there is highly correlation between increasing of the endogenous levels of free SA in treated plants and reduction of the blighted leaf areas. SA pre-treatment plants caused an increase in the endogenous free SA levels in tomato leaves which resulted in systemic resistance induction. Plants have evolved several layers of defense responses in the face of attack by microbial microorganisms that threaten their survival. One of these responses is Systemic Acquired Resistance (SAR) that can be induced by some of pathogen avirulent genes product or by abiotic physical or chemical agents called elicitors (Durrant and Dong, 2004). Applications of chemicals which activate plant defense mechanisms before pathogen attack with no environmental side effects have drawn a considerable attention of researches in this area. Tomato (Lycopersicon esculentum Mill.) is one of the popular cash crops, recently recognized as a model plant for plant-pathogen interactions (Arie et al., 2007). Its cultivation, however, has been limited by an abundance of diseases caused by fungi, bacteria, viruses and nematodes. Alternaria leaf spot or stem canker is a common foliar disease of tomato occurring in most regions of Iran and causing 10-15% annual loss. Tomato stem canker is one of the most devastating diseases worldwide, caused by Alternaria alternata f. sp. lycopersici Grogan and is responsible for significant economic losses sustained by tomato producers each year (Thomma, 2003). One of the potential plant disease management strategies is the use of Systemic Acquired Resistance (SAR) to activate host defense mechanisms (Ryals et al., 1994). Chemical activation of disease resistance in plants represents an additional option for growers to protect their crops from losses due to plant diseases. One of the most commonly used chemicals inducers is Salicylic Acid (SA), which appear to mimic the systemic effects of localized infection (Kessmann et al., 1994; Vallad and Goodman, 2004). SA appears to be a central signaling component in SAR (Yalpani et al., 1991; Vallad and Goodman, 2004). The necessity of SA for the expression of SAR in tobacco was shown in experiments with the salicylate hydroxylase (nahG) transgene, which converts salicylate into catechol (Gaffney et al., 1993). There are some reports regarding pre-treatment of plants by SA can be effective against Alternaria sp. fungi in tomato and other plants (Spletzer and Enyedi, 1999; Coquoz et al., 1995; Weete, 1992). Systemic resistance to A. solani in tomato using 200 μM SA feeding treatment in a hydroponically grown system has been induced (Spletzer and Enyedi, 1999). Also, inducing systemic resistance to A. cassiae in sicklepod (C. obtusifolia) by using a foliar application of 1000 μM SA has been achieved (Weete, 1992). Exogenous application of SA and some other chemicals including: polyacrylic acid, acetyl salicylic acid, 2, 6-dichloroisonicotinic acid, methyl salicylate, jasmonic acid and jasmonic methyl ester, benzothiadiazole derivatives, DL-B-aminobutyric acid and oxalic acid, can induce accumulation of pathogenensis-related proteins and lead to reduced incidence of several diseases on many crops (Gozzo, 2003). Since SA is an important signal molecule that plays a critical role in plant defense against pathogen invasion (Spletzer and Enyedi, 1999; Coquoz et al., 1995; Weete, 1992; Malamy et al., 1990) and the potential use of that against tomato stem canker has not investigated yet, we examined if the exogenous foliar application of SA could activate SAR against A. alternata f. sp. lycopersici in tomato leaves. Plant materials: Seeds of tomato cv. Ergon were surface sterilized with 1% Ca (OCl)2, washed three times with sterile distilled water and dried under a laminar flow hood. The seeds were planted in 25 cm diameter pots containing 4 kg steam-sterilized sandy-loam soil and kept in an environmentally controlled greenhouse at 24±2°C with 16 h of light and 8 h of dark till desired stage. Young plants, approximately 3 weeks old at four-leaf stage were selected and transplanted for use in the experiments. Inoculum preparation: Single spore of Alternaria alternata isolate M11 (isolated from infected tomato in Hamadan Province, Iran, 2006) was grown on Potato Carrot Agar (PCA). The incubation temperature was 22±2°C, under a diurnal cycle of 8 h light and 16 h darkness. Three-week-old cultures were flooded with approximately 10 mL of distilled water and conidia were dislodged with a glass spreader. The inoculum density was adjusted with sterile distilled water to 1x105 conidia mL-1 using haemocytometer. Greenhouse experiments: Greenhouse experiments were setup at College of Agriculture, Bu Ali Sina University greenhouses in summer 2006. SA was obtained from Sigma-Aldrich and was dissolved in sterile distilled water to final concentration of 200 and 400 μM solution, pH 6.4. Three days prior to conidial suspension application, three-weeks-old at four-leaf stage tomato plants were planted in plastic pots and sprayed by concentrations of 200 and 400 μM of SA. Forty eight hours before inoculation, pots were kept in growth chamber with relative humidity near 85-90% and temperature between 24±2°C. After foliar inoculation of the plants with conidial suspensions (1x105 conidia mL-1) they were remained in a fairly dark condition for another 24 h. Plants were evaluated daily for appearance of disease symptoms. Control plants were sprayed with sterile distilled water. Treatments were consisted of four pots each containing two plants and were arranged in a completely randomized design with four replications. This experiment was conducted three times and representative data from one of the trials are shown in the results. Microscopic observations of the leaf surface: Leaves of the inoculated tomato plants were detached at 1 and 14 days after challenge-inoculation. Five leaf disks from a newly emerged compound leaf (not SA-treated leaves) were collected from each plant per four replications. The numbers of penetration attempts and single cell necrosis reactions were observed using a microscope (Zeiss, Biomed, Germany) equipped with filter set 05 (BA-420 long-pass). The extend of disease symptoms was determined by measuring the infected area of necrotic lesions and counting the necrosis lesions number on all compound leaves 14 days after inoculation with the aid of low magnification of microscope. This experiment also was conducted three times and representative data from one of the trials are shown in the results. HPTLC analysis: a densitometric method by USING HIGH Performance Thin Layer Chromatography (HPTLC) which already has established for the rapid and accurate identification and quantitative determination of acetylsalicylic acid, ascorbic acid and salicylic acidby Krzek and Starek (1999) was performed in this study. Inoculated and non-inoculated leaf tissue samples from different treatments were harvested 14 days after SA application, examined and assessed in terms of their free salicylic acid content. Fresh tissue samples (0.5 g) were ground in 20 mL methanol and sonicated for 20 min. The extracts were filtered and the solvent was evaporated to dryness in vacuo. Then the extracts were resuspended in 5 mL of 3-flouro acetic acid. The free SA was extracted by ethyl-acetate: cyclo hexan: iso-propanol (50:50:1, v/v), two times, each with 10 mL of solvent mixture. Finally the organic phase was collected and re-evaporated to dryness and redissolved in 1 mL of acetone. HPTLC system include TLC Scanner 3 and Linomat 5 sprayer samples winCAST 1.2.2 software (CAMAG, Switzerland, Muttenz) was used for determination of free SA in leaf samples. TLC was performed on silica gel plate (Merck, 60F254, 20x30 cm). The solvent system which has been used was: Normal hexane: Di methyl ether: Formic acid (0.4: 1: 1). Sample spraying done with Linomat 5 sprayer samples and under liquid nitrogen atmosphere. A microliter Hamilton syringe used for sampling. Applied 10 ppm of SA as internal standard and maximum absorption obtained at 305 nm wavelength of spectra region (Krzek and Starek, 1999). Statistical analysis: All studies were arranged in a completely randomized design with four replicates. Data were subjected to analysis of variance and mean values were separated by the Least Significant Difference (LSD) test at p = 0.05. In recent years, there has been an increasing interest in non-chemical control methods in plant disease management. White (1979) has earlier shown that exogenous SA application on tobacco can activate SAR. This raises the interesting possibility of altering the normally compatible Alternaria-host plant interaction to an incompatible one by using SA treatment. To this aim we analyzed the effect of exogenous applications of SA, to clarify it`s potential ability to suppress stem canker disease of tomato plants. The results from greenhouse and laboratory experiments indicated that, challenge inoculation of SA-treated tomato plants using conidia of A. alternata f. sp. lycopersici resulted in 54.7% fewer necrosis lesions per leaf and 87.5% reduction in blighted leaf area (mm2) as compared with controlled plants not receiving SA (Fig. 1). The results obtained from foliar application of two different concentrations, demonstrated that application of 200 μM dosage of SA was insufficient for inducing disease resistance. But, Spletzer and Enyedi (1999), have found that the addition of 200 μM SA to the root system significantly increased the endogenous SA content of tomato leaves. This firstly, might be due to the different SA application methods and secondly because of the different fungal species which have been used in these two pathosystems. In present study, foliar application of 400 μM SA significantly increased the endogenous SA content of leaves. The blighted areas also were significantly reduced in all plants treated with 400 μM SA. 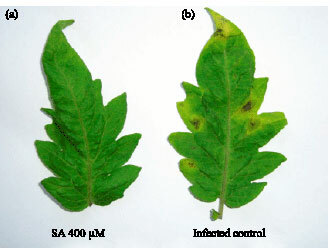 However, earlier results obtained by Spletzer and Enyedi (1999) indicated that hydroponically tomato root treated with 500 μM SA exhibited a loss of leaf turgor as evidenced by leaf wilting. Also, Yildiz and Guven (2007) found that application of 1000 μM SA on grapes against Uncinula necator has induced systemic resistance, but has caused reduction in chlorophyll content, resulted in chlorosis symptoms. But results obtained in current study had no such side effects which already have been found. When a strong/fast resistance reaction is induced, this is usually associated with a host cell death pattern whose consequence is the isolation of the invading pathogen from healthy host tissue. A microscope-based screening for apparent discoloration of the host cell wall on different treatments was conducted. No visible responses were found in the leaf tissues at 24 h after inoculation. The number of HR lesions and cell wall browning were not detectable by the naked eye. Penetration events were not distributed randomly on the treated leaves (Fig. 2, 3). There was significant effect of plant cell reactions in terms of percentage of penetration events that occurred 14 days after challenge-inoculation in the site of attempted penetration. SA treated plants were identified with higher penetration attempts, therefore higher numbers of single cell HRs, but lower blighted area and discolorations as compared with non treated plant (control), which had higher rate of blighted area (Fig. 2, 3). This is probably because of the hypersensitive response which is a common manifestation of plant disease resistance that is characterized by rapid cell death around the point of infection, restricting the spread of pathogens. Grant and Mansfield (1999) have already reported such a necrosis-inducing activity in tomato and also single cell reactions in which failed penetration attempts in other Alternaria-host pathosystems has been indicated (McRoberts and Lennard, 1996). 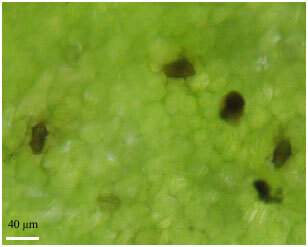 Recently it has been found that, in tomato and another necrotrophic pathogen (Botrytis cinerea), callose deposition was present as single spots corresponding with unsuccessful fungal penetration attempts (Asselbergh and Hofte, 2007). The results obtained in greenhouse experiments clearly indicated that exogenous application of SA, in concentration of 400 μM on tomato leaves have reduced the blighted leaf area (2.25 mm2) significantly (p<0.05), as compared with infected control (10.31 mm2). This compound has shown it`s ability to accumulate free-SA content in leaves (10.4 μg g-1 fresh weight) which was three-fold higher than the control plants (3.2 μg g-1 fresh weight). It also activated Systemic Acquired Resistance(SAR) which was effective against stem canker disease. The results obtained from HPTLC analysis have indicated highly correlation between increasing the endogenous level of free SA in treated plants and reduction of the blighted leaf area (Fig. 4). This is in agreement with the results of other publications which also found that any disruption in the plant`s ability to accumulate salicylic acid results in the loss of pathogenesis-related protein gene expression and attenuation of the SAR response (Gaffney et al., 1993; Lawton et al., 1996; Vernooij et al., 1994). These reports support our finding that reduced disease incidence could be achieved by using SA pre-treatment. Foliar application of arachidonic acid to potato has activated SAR against A. solani (Coquoz et al., 1995). It has been indicated that, arachidonic acid caused an increase in the endogenous, free SA levels in potato (Coquoz et al., 1995) and this is consistent with our observation that SAR in tomato occurs in correlated with SA levels (Fig. 4). We have also demonstrated that the ability of a compound to accumulate endogenous free-SA correlates with its potential to induce resistance of tomato to Alternariosis. This is in accordance with the results obtained by Spletzer and Enyedi (1999), as found that the addition of 200 μM SA to the root system significantly increased the endogenous SA content of leaves, resulted in 77% reduction in blighted leaf area (caused by Alternaria solani) as compared with control plants not receiving SA. But, foliage application of 200 μM in our experiment was not sufficient for inducing disease resistance. This might be due to the different species which have been used in these two pathosystems. However, Thomma et al. (1998, 2001) have found that neither salicylic acid nor ethylene is directly involved in resistance against Alternaria in Arabidopsis. This contradiction results seems to be related with different host plant system which have been used in these different experiments. Our data indicate that induced resistance may have potential as a disease control method in tomato crop. Furthermore, the finding that exogenous SA treatment increased the accumulation of free SA content of leaves suggests that in tomato the systemic induced response is SA-dependent and therefore may offer other means of SAR induction. This may be a particularly attractive option for greenhouse tomato growers where elicitor application could be easily integrated with existing management practices. This is the first report of enhancing systemic acquired resistance against tomato stem canker disease, induced by foliar application of salicylic acid. Further studies are needed on different tomato cultivars to evaluate more accurately the efficacy of this chemical inducer and duration of the SA-induced response in tomato. This study was supported by the Iran National Science Foundation (Grant No. 84695/15), we also wish to express our gratitude to the Research Council of Bu-Ali Sina University, Hamadan, Iran, for providing glasshouse facilities. Also, our appreciation is expressed to Prof. P. Salehi, the director of Medicinal Plant Researches Centre, Shahied Beheshti University, Iran, for providing the necessary facilities to carry out this work. Arie, T., H. Takahshi, M. Kodama and T. Teraoka, 2007. Tomato as a model plant for plant-pathogen interactions. Plant Biotechnol., 24: 135-147. Asselbergh, B. and M. Hofte, 2007. Basal tomato defences to Botrytis cinerea include abscisic acid-dependent callose formation. Physiol. Mol. Plant Pathol., 71: 33-40. Coquoz, J.L., A.J. Buchala, P. Meuwly and J.P. Metraux, 1995. Arachidonic acid induces local but not systemic synthesis of salicylic acid and confers systemic resistance in potato plants to Phytophthora infestans and Alternaria solani. Phytopathology, 85: 1219-1224. Durrant, W.E. and X. Dong, 2004. Systemic acquired resistance. Annu. Rev. Phytopathol., 42: 185-209. Gaffney, T., L. Friedrich, B. Vernooj, D. Negrotto and G. Nye et al., 1993. Requirement of salicylic acid for the induction of systemic acquired resistance. Science, 261: 754-756. Gozzo, F., 2003. Systemic acquired resistance in crop protection: From nature to a chemical approach. J. Agric. Food Chem., 51: 4487-4503. Grant, M. and J. Mansfield, 1999. Early events in host-pathogen interactions. Curr. Opin. Plant Biol., 2: 312-319. Kessmann, H., T. Staub, C. Hofmann, T. Maetzke and J. Herzog et al., 1994. Induction of systemic acquired disease resistance in plants by chemicals. Annu. Rev. Phytopathol., 32: 439-459. Krzek, J. and M. Starek, 1999. Densitometric determination of active constituents and impurities in complex analgesic and antipyretic pharmaceuticals. J. Chromatogr., 5: 356-360. Lawton, K.A., L. Friedrich, M., Hunt, K. Weymann and T. Delaney et al., 1996. Benzothiadiazole induces resistance in Arabidiopsis by activation of the systemic acquired resistance signal transduction pathway. Plant J., 10: 71-82. Malamy, J., J.P. Carr, D.F. Kessig and I. Raskin, 1990. Salicylic acid: A likely endogenous signal in the resistance response of tobacco to viral infection. Science, 250: 1002-1004. McRoberts, N. and J.H. Lennard, 1996. Pathogen behavior and plant cell reactions in interactions between Alternaria species and leaves of host and nonhost plants. Plant Pathol., 45: 742-752. Ryals, J., S. Uknes and E. Ward, 1994. Systemic acquired resistance. Plant Physiol., 104: 1109-1112. Spletzer, M.E. and A.J. Enyedi, 1999. Salicylic acid induces resistance to Alternaria solani in hyroponically grown tomato. Biochem. Cell Biol., 89: 722-727. Thomma, B.P.H.J., 2003. Alternaria spp. : From general saprophyte to specific parasite. Mol. Plant Pathol., 4: 225-236. Thomma, B.P.H.J., I.A.M.A. Penninckx, W.F. Broekaert and B.P.A. Cammue, 2001. The complexity of disease signaling in Arabidiopsis. Curr. Opin. Immunol., 13: 63-68. Thomma, B.P.H.J., K. Eggermont, I.A.M.A. Penninckx, B. Mauch-Mani, R. Vogelsang, B.P.A. Cammue and W.F. Broekaert, 1998. Separate jasmonate-dependent and salicylate-dependent defense response pathways in Arabidiopsis are essential for resistance to distinct microbial pathogens. Proc. Nat. Acad. Sci. 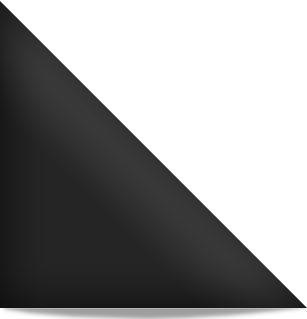 USA., 95: 15107-15111. Vallad, G.E. and R.M. Goodman, 2004. Systemic acquired resistance and induced systemic resistance in conventional agriculture. Crop Sci., 44: 1920-1934. Vernooij, B., L. Friedrich, A. Morse, R. Reist and R. Kolditz-Jawhar et al., 1994. Salicylic acid is not the translocated signal responsible for inducing systemic acquired resistance but is required in signal transduction. Plant Cell, 6: 959-965. Weete, J.D., 1992. Induced systemic resistance to Alternaria cassiae in sicklepod. Physiol. Mol. Plant pathol., 40: 437-445. White, R.F., 1979. Acetylsalicylic acid (aspirin) induces resistance to tobacco mosaic virus in tobacco. Virology, 99: 410-412. Yalpani, N., P. Silverman, T.M.A. Wilson, D.A. Kleier and L. Raskin, 1991. Salicylic acid is a systemic signal and an inducer of pathogenensis-related proteins in virus-infected tobacco. Plant Cell, 3: 809-818. Yildiz, L. and A. Guven, 2007. The appearance of systemic acquired resistance components in SA-treated or naturally induced Vitis plants by Uncinula necator. Pak. J. Bot., 39: 183-191.